En rapport oversendt fra Dr. Michael Smith. Jeg vil dele disse erfaringene med alle dere som arbeider med NADA-protokollen og alle som er intressert i å lære mer om dette fantastiske verktøyet. Vedlagt er en fantastisk beskrivelse av NADA i Kenya sendt til Lars Megan Yarberry for hans kommende bok. Skrivingen er en utmerket oppsummering av de sosiale og psykologiske fordeler av vårt arbeid.Spesiell takk til Lars til å be om rapporter på verdensbasis. NB: Minner om at Dr. Micheal Smith som grunnla organisasjoen, National Acupuncture Detoxification Association (NADA) kommer til Norge og skal ha en workshop i slutten av september. Endelig dato vil bli bekreftet på nada-norge.no. Dr. Smith vil også følge deler av neste kurs som NADA Norge arrangerer 4-6.okt. Because NADA is so flexible, it can be adapted to any context, and any population group. In many of the communities where we have provided training and treatment, children make up a large part of the affected population, and respond very well to NADA treatment. As a general rule, we offer needles to those children who will tolerate them, reducing both the number of needles and the retention time. In most high-needs areas where we work, many children will accept needles, especially after seeing family members or peers receiving them. The main points we use when needling are shen men and either kidney, liver, or lung. Some parents will pressure children into receiving needles, but if the child is distressed by this idea, we prefer to apply ear beads. For children under five we often use only one bead on shen men on either the front or the back side of the ear. We advise the parent or guardian when to remove the bead, and advise them to contact a NADA provider with any questions or concerns. In our experience, children often exhibit the effects of psychological or emotional trauma through symptoms such as increased bed-wetting, anxiety, or increased aggression with siblings or peers. Family members often report reduction in these types of symptoms after one or more NADA treatments. 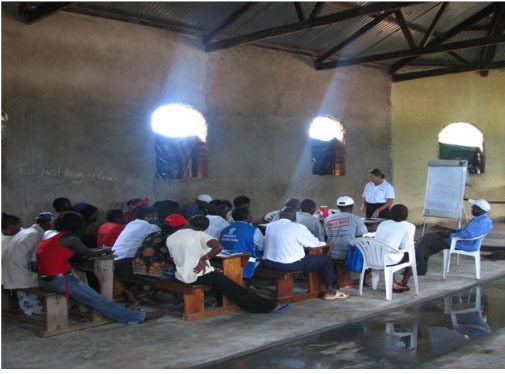 We offered training to the school staff and administration, while providing treatment to the students. Many of the students were very nervous about being needles, so we always started with a demonstration on one of the training team, and never forced anyone to receive treatment. Adolescents are naturally curious, and after the first day of treatment, most students came regularly to the NADA sessions. In addition to the NADA treatments, we also offered yoga classes and art therapy sessions. Student responses were often dramatic. One girl said that for years she had been having dreams of lying at the bottom of a grave watching dirt being shoveled on top of her. After treatments, she said she slept like she had when she was a little girl. Another student said that she felt happy like when her parents were still alive. Some of the aggressive behaviors in the boys reduced after treatments began. In 2010, a major earthquake hit Haiti, causing massive injury, death and damage to infrastructure. 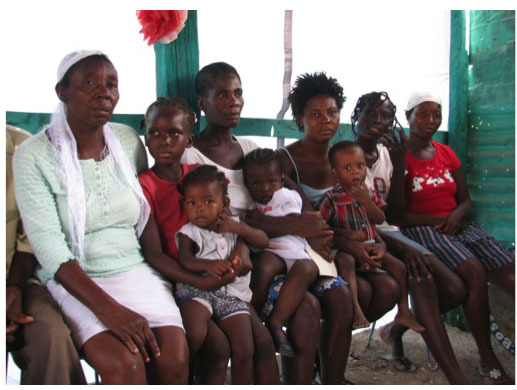 We began planning a trip to Haiti in the hopes of providing treatment and training options to the devastated populace. The situation on the ground was extremely challenging. Communication, personal security, corruption, and disease were already problems in Haiti before the earthquake, all of which got much worse after the natural disaster. We networked with a group of American Naturopathic Physicians also planning a relief mission, and networked through international and local non-profit agencies to arrange housing, transportation, and access to patient populations. We provided training to a diverse group of healthcare workers, community volunteers and university students in the medical field. Clinical training was done at several of the extensive “tent cities” that spread across Port-au-Prince and surrounding areas. People responded extremely well to the treatments and were appreciative of the support. Many patients had recent amputations from crush injuries during the earthquake, and we noted that these individuals requested extra long treatment times sometimes sitting with the needles for more than an hour and even after needles had been removed they sat with the treatment group for most of the time we were providing services at the site.